Perhaps one can say modern astronomy began in 1610 when Galileo peered at the heavens through his 8-power telescope. In amazement his eyes beheld clearly for the first time some of the major features of the solar system: the mountains of the moon, the phases of Venus, sunspots, the colored bands of Jupiter. As he looked at Saturn, Galileo saw what seemed to be handles. Actually, he was seeing Saturn's rings, but he thought he must be looking at moons such as Jupiter has. When he looked again some time later, Saturn was at a different angle and the rings were not visible through his little spyglass. Expressing his astonishment that the "moons" had disappeared, he asked "Has Saturn, perhaps, devoured his own children?" As telescopes improved, and knowledge of the heavens increased, man's ancient dreams of reaching out into space were stimulated. Vivid imaginations suggested devices such as Jules Verne's concept of a powerful cannon that could blast three men and animals on a voyage around the moon. Not satisfied with the moon, man has been reaching beyond. He has launched small but sophisticated devices equipped with complex detection and transmitting instruments to probe the secrets of the planets. A machine designed by humans lands on Mars and sends back pictures of its barren surface, including shots of a little mechanical shovel digging into the crust of the red planet and holding the dirt up to the camera lens. A close fly-by produces color pictures of a volcano erupting on one of Jupiter's moons. Some 950 million miles from earth, a tiny craft made by man now has examined Saturn's rings and sent the information back to its human masters. And what of the future? Plans are on the drawing board for huge space stations to orbit the earth. They would fulfill numerous functions. They could serve as observatories where telescopes could study the heavens more effectively, being unhindered by the pollution and turbulence in the earth's atmosphere. Such stations could be used for launching missions to further explore outer space. 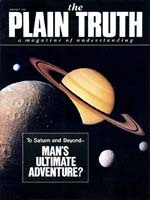 The information that man's instruments and inventions are now revealing and compiling about the universe is awesome. The capabilities of the instruments themselves are awesome. And just as awesome is what the instruments reveal about the marvelous mind of man. How is it that human beings can do such things, that they have mental abilities so far above all other living creatures? There may still be some animals that look up into the night skies and acknowledge the full moon with a grunt or a howl. But none of them ponders the whys and hows of the universe. None of them calculates the movements of planets or the distance of the nebulae invisible to the naked eye. No animal has ever made or has even thought of a telescope or a vehicle to be launched out past the earth's gravitational field. No animal can design a computer that enhances a photograph taken hundreds of millions of miles out in space. How is it that man has such a mind? This is a question no atheist can satisfactorily answer. Before the awesome significance of man's mind they stand speechless. Evolutionary science cut off from the knowledge of God cannot account for it. While some species of animals have brains that look very similar to the human brain, the similarity is physical only. In mental capacity and genius no other creature comes close. Why? The truth is that the human mind is a special creation of God, far more complex than the astounding features now revealed in the solar system. As the Bible reveals, "there is a spirit in man" (Job 32:8). The verse goes on to explain that the Almighty gives to man the power of understanding and intellect through that spirit. God has given to human beings a spark of his mind power. That man's thoughts are able to soar above his earthly surroundings, that he is able to wonder about the universe and send spacecraft out to, explore the limits of our solar system reflects but a portion of the human potential revealed in Scripture. Notice how some of that potential is referred to in Genesis 11, where man's first attempt to reach into the heavens is described. Human beings gathered themselves together and said: "'Come on, let us make a name for ourselves by building a city and a tower whose top reaches to heaven; it will keep us from being scattered all over the wide earth.' Down came the Eternal to see the city and the tower that human beings had built. 'They are one people,' said the Eternal, 'and they have one-language; if this is what they do, to start with, nothing that they ever undertake will prove too hard for them'" (Genesis 11:4-7, Moffatt version). The testimony of God himself about the potential of man's mind is that whatever man sets out to do, he can accomplish. Fortunately God is going to require that the vast potential of the human mind be used for good purposes only. Why not read about the mind God has created in man by reading The Incredible Human Potential by Herbert W. Armstrong.